Easy utilisation, high quality screen resolution, capacitive touch screen and single touch features. The VIP70 – STD (IP Monitor) is a long Iife screen with fast touch detection and capacitive touch function, all in a Android GUI. 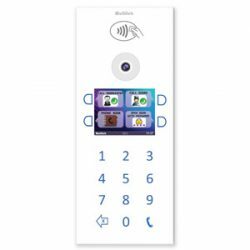 Designed with the user experience in mind including functions: calling, phone book, camera view (up to 9 security cameras), contact security/concierge, video calls, emergency call, SMS messaging (between devices), alarm clock. 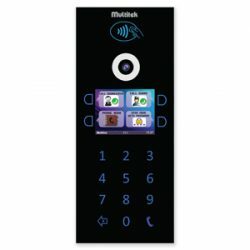 The intercom in the network works like a telephone exchange and each room can communicate via conference call, video call, direct dialing or SMS. The concierge feature can be used to give orders to external locations from the network e.g. Calling a cab, checking the pickup or delivery from a courier. All devices may be connected to the network easily. The installation and maintenance of the intercom system does not require any special training, device or computer. The System software is installed or updated by SD card or remotely via internet.